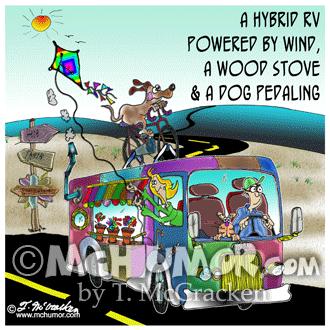 Europe Cartoon 3283: An elderly couple huffing and puffing on bikes around the Eiffel tower are caught up in a race. 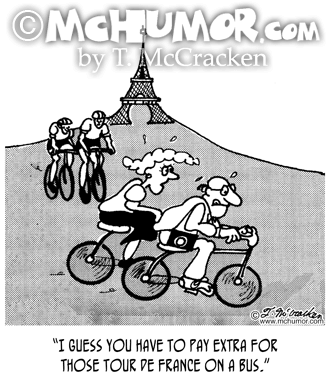 One says: "I guess you have to pay extra for those Tour de France on a bus." 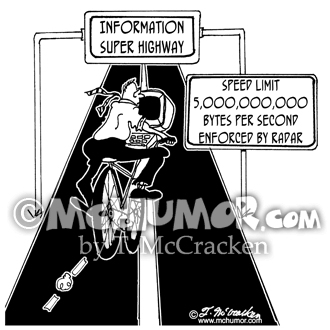 Computer Cartoon 6239: A man with a computer on a bicycle bikes on the "Information Super Highway" that has a sign that says, "Speed Limit, 5,000,000,000 bytes per second. Enforced by radar." 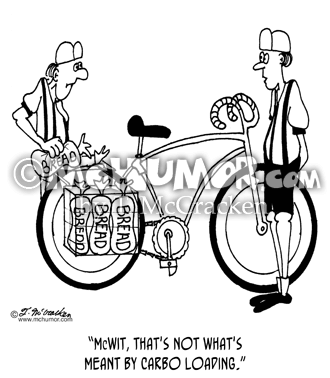 Bike Cartoon 4231: A bicyclist saying to another who's stuffing loaves of bread into his bicycle basket, "McWit, that's not what's meant by carbo loading." 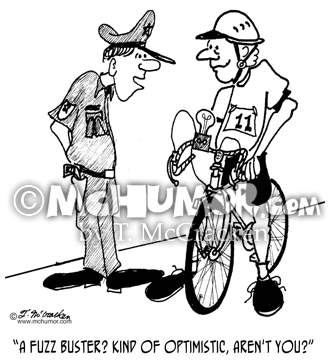 Bike Cartoon 1704: A highway patrol officer saying to a bicycle racer with an odd gizmo on his handle bars, “A fuzz buster? Kind of optimistic, aren't you?" 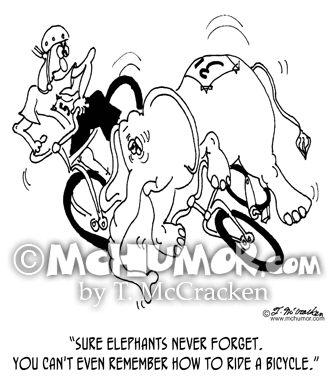 Bike Cartoon 6724: A bike racer saying to an elephant that's just fallen off a bicycle, "Sure elephants never forget. You can't even remember how to ride a bicycle." 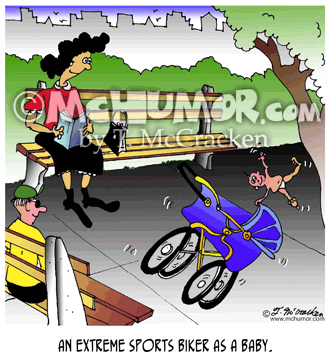 Bike cartoon 7086: "An extreme sports biker as a baby." A baby buggy bounces on one wheel. 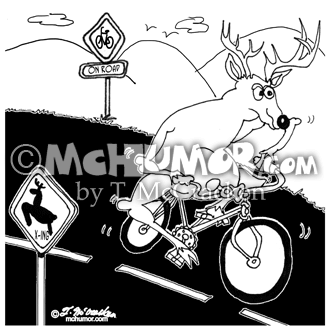 Deer Cartoon 6721: A deer rides a bicycle on a road with Deer Crossing and Bikes on Road signs. 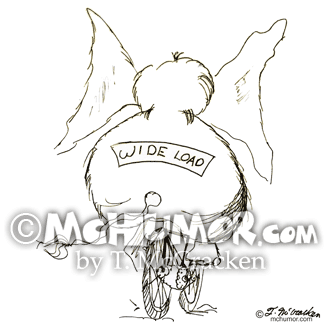 Bicycle Cartoon 1078: An Elephant on a bike with sign with a sign "Wide Load." 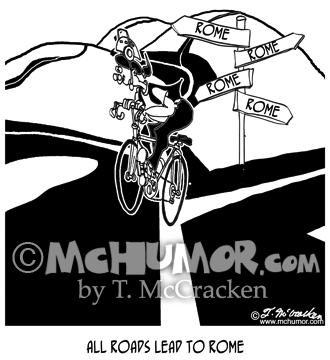 Bike Cartoon 8926: "All Roads Lead to Rome." A biker at a crossroads where road sign arrows point in all directions and say, "Rome."